A new and newly annotated selection of letters--the only selected edition available in hardcover--from the English eighteenth-century historian, novelist, and politician whose correspondence is one of the most admired in English literature. Author of the first gothic novel and son of the first prime minister of Great Britain, Horace Walpole had wide-ranging interests that included literature, politics, world affairs, collecting, antiquities, and architecture. He wrote to his numerous correspondents on these and other topics in prose that is celebrated for its charm, eloquence, and wit. This new Everyman's edition offers an extensive selection of Walpole's letters, helpfully arranged by subject so the reader can choose from themes including social life, the Court, politics, literature, and the evolution of his Gothic castle and art and book collections at Strawberry Hill. 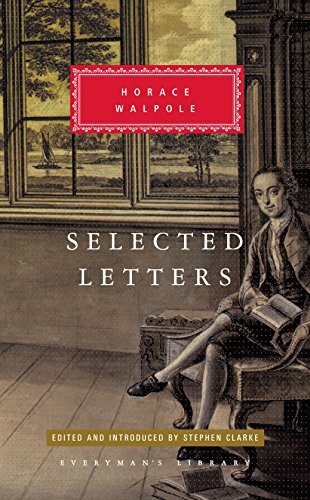 This edition offers new annotations throughout, with introductions to its various sections and a general introduction on Walpole as a letter writer. In addition, the text of the letters has been corrected and previously excised passages have been restored. A new and newly annotated selection of letters - the only selected edition available in hardcover from the English eighteenth-century historian, novelist, and politician whose correspondence is one of the most admired in English literature.